Now don’t let the title fool you – I love Warlords of Draenor. I love it far more than the tolerable Mists of Pandaria, more than my apathy allowed for Cataclysm, and I even like it more than Wrath of the Lich King, which up until this point was the last expansion that I pined for. So let me be clear that I love Warlords of Draenor so far – when I’m able to play it. 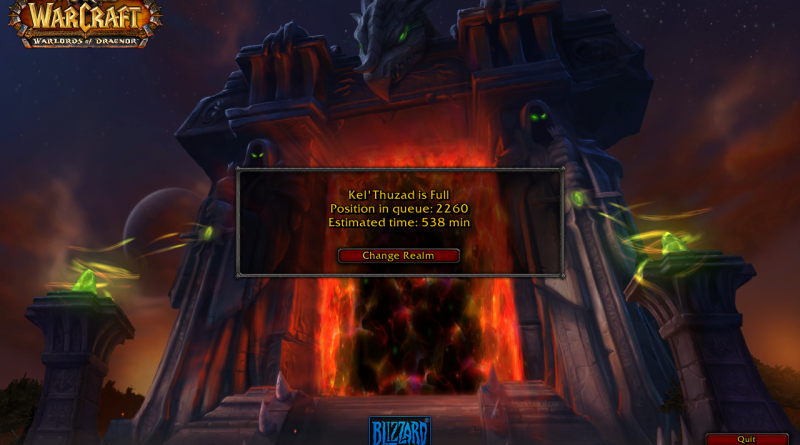 But that’s the real problem with WoD right now: you can’t play. Let me take you back about half a week. Midnight on Thursday, November 13. I’m sitting in game, listening to my guild in vent, and getting ready for the launch. Then suddenly it happens: WoD is now live. I recieved a quest telling me to talk to Khadgar right at the Dark Portal. Enter problem 1: The Bottleneck. This might not be much of an issue in a few months when most of the regular players will have reached 100, but during the midnight launch it was a disaster. Without giving away too many spoilers, the quest line at the beginning of WoD is linear: players cannot skip parts of the quest line until about 15 quests in – basically until you found your garrison. This means that the server is literally clogged with hundreds of players standing on top of the quest giver, ninjaing quest items and lagging up the entire server so that it crashes almost continuously. This leads to my second complaint- The server cap. Blizzard lowered the maximum server cap drastically in order to not overwhelm their hardware (also possibly in response to a massive DDoS attack) which means that during peak hours almost all servers are locked. As you can see above, this results in massive wait times to even log in (6 hours is my personal record, but some guild mates waited almost 10 hours). If you combine these factors, added with the fact that the servers were constantly crashing most of Thursday and even for a good chunk of Friday, it made the game pretty unplayable. Now of course I need to add that when I was able to play the game it was fantastic. Once you get out of the overpopulated starting zone, and progress toward your Garrison, the game becomes far less laggy. Blizzard will probably increase the server cap over the next few weeks until it gets back to its normal maximum, and at that point there shouldn’t be much of an issue with logging in. 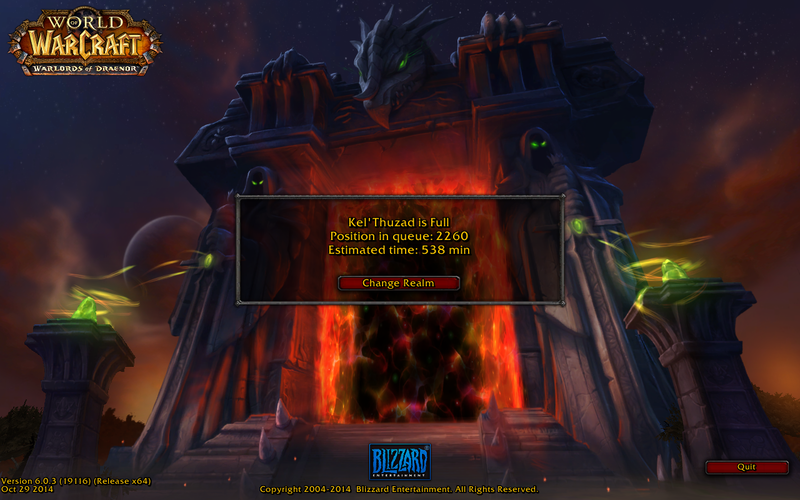 I’m on the Kel’Thuzad the server, which is one of the most populated alliance servers, and up until today I haven’t really had to sit in the queue in order to log in it. Last time I really had to wait to login was during the heydays of the Burning Crusade, back when wow was able to boast a good 11 million subscribers, rather than the 8 million that has now. I am going to be writing a more detailed review of the game a little later. 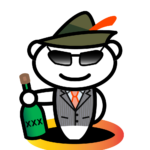 This post is mostly just an opportunity for me to vent about how terrible the rollout was. Really, really terrible, worse than Mists of Pandaria was. For those of you who played MoP, the opening quest line was unplayable. It’s actually still pretty unplayable, from my own personal opinion, but at least you don’t have to deal with about 500 other players on their gyrocopters trying to blow up the one barrel on one ship all at the same time. In summation, here’s a bullet point list of what is, and what isn’t, Blizzard’s fault relating to this disaster of a release. Basically, Blizzard got hit by a massive DDoS attack and weathered it as best as it could, but any attempt (as some have tried) to shift all of the blame on the launch of WoD onto the DDoS attack is facile at best. Joystiq has an excellent article on this subject that goes into far more detail than I care to. In short, I love the game, and I’m sure I will continue to love it if I can ever actually get in game.